Verizon surprised us back in February when it announced the Wear24, its own LTE-enabled smartwatch. It's an Android Wear 2.0-running watch that doesn't bring any new ideas to the tables, which does make it a bit of an odd addition to the Wear family. It's ready to fill the void of the LG Watch Sport, which the network mysteriously decided to cancel. In its place we've got another circular smartwatch that comes packing LTE connectivity, Wi-Fi and NFC. Priced at $299.99 with a two-year contract and $349.99 without, the steel-cased Wear24 seems to be offering itself up as an alternative to LG's Sport. But is it actually a good alternative, and do Verizon's notorious pieces of bundled-in software enhance or bungle the experience? Here's our verdict. If you enjoy nondescript design then you'll love the Wear24. This is a watch that wants to be as simple as possible, so simple that it borders on generic. The stainless steel watch face isn't trying to be bold and it certainly isn't going to turn any heads. In fact, it's pretty much the opposite. No one is going to notice this thing on your wrist. It's not that it looks bad, because it doesn't, but that it looks incredibly familiar. There's also a soft silicone rubber band that's surprisingly decent. It's nothing to write home about, but it's nothing to complain about either. It's closest sibling aesthetically is the LG Watch Sport, though the Wear24 strips it back further. Rather than sport three buttons, it sports one. That's right, there are no twisting bezels or crowns here, just a singular button and the touchscreen, which sports a 1.39-inch AMOLED display with a 400 x 400 resolution and 290ppi. It's bright, the colors pop nicely, and it fares well in bright and sunny conditions. That one button, though, acts as both a menu and back button. When you're on your watch face, you give it a click and you head to the app menu. When you're in an app, you give it a click and head back to the previous screen. It's simple, but it also feels limiting. Other watches have turned to rotating mechanisms, like bezels and crowns, to make navigating around smartwatches more intuitive. This makes the Wear24 feel a little archaic. On the wrist, the 42mm watch face and 13.4mm thickness has a satisfying heft to it. The Wear24 doesn't feel like it's going to overtake your wrist, but it also doesn't feel like it blends into your person. Like everything else in regards to the design of this smartwatch, it's rather shrug worthy. When you'll get Android Wear 2.0? The Wear24 comes with a pretty beefy 450mAh battery, and in real-world use you can really feel that beefy battery living up to itself. With basic use, I was able to consistently get about a day and a half of use. Of course, when you start dipping into heavy use - doing some GPS-based runs and turning up that screen brightness - that's when you start to see that battery life draw fewer breaths. In this case, I was able to eke out just under a day of battery life. The Verizon Wear24 is a pretty solid entry-level Android Wear 2.0 smartwatch but that's about as good as it gets. It's got zippy performance with good battery life, GPS and LTE. However, it's also $349 with no two-year contract, making it way too expensive for a smartwatch that lacks a heart rate sensor, comes with a bland design and has no Android Pay support despite having NFC built-in. 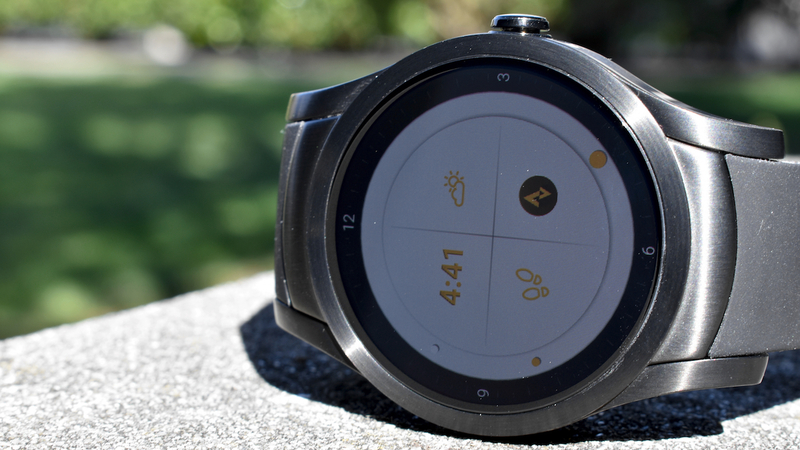 Unless you really need an LTE-enabled smartwatch on Verizon's network, it's best to skip this Wear watch.